How to edit DNS records on Domain.com? 1. Go to the Domain.com login page and log in to your account. 2. This will take you to the Domain.com Control Panel, seen below. Click DomainCentral in the My Favorites section. 3. Click on your domain, then DNS. 4. From the Modify drop-down, select CNAME Alias. 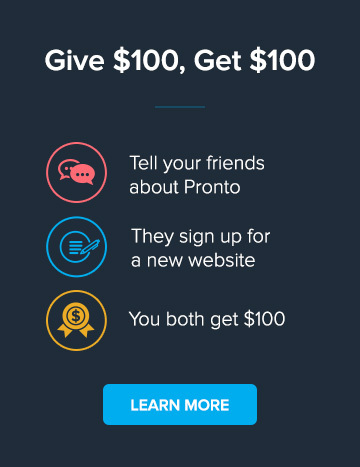 If you already have a www entry for the domain, then select Edit from the Action drop-down, and you can just edit it to yourwebsite.client.bypronto.com. If you don't have a www entry, enter www in the Host textbox, and yourwebsite.client.bypronto.com in the Point To textbox, then click Add. Ensure you replace yourwebsite.client.bypronto.com with the location provided by your Project Manager. Ensure you don't have any other www entries for this domain or you will create a DNS conflict after updating the record. 5. From the Modify drop-down, select A Record. If you already have an @ entry for the domain, it will be shown in the Host column as your domain name. Select Edit from the Action drop-down, then change the IP address in the Points To field to 54.247.91.90. If you don't already have an @ entry for the domain, enter @ in the Host textbox, and 54.247.91.90 in the Points To textbox. Ensure you don't have any other @ entries, or entries with your domain in the Host column, for this domain or you will create a DNS conflict after updating the record. It will take some time for your DNS to propagate around the world - it can take up to 48 hours, but sometimes takes as little as 10 minutes. Once this process is completed, your new website will be live. If you have any questions or concerns, feel free to get in touch and we can assist. How to edit DNS records on Network Solutions?